Sow cornflower seeds in early spring after all threat of frost has passed. Choose an area of the garden which receives full to partial sun and has average, well-drained soil. Space seeds 2 to 3 inches apart and plant about ½ inch deep. Cornflower seeds need complete darkness for germination to occur. Water cornflower plants once per week only on weeks which do not receive rainfall. Allow the soil to dry out slightly between waterings. Do not allow the soil to become too dry, or the plants may flop over. However, cornflower is drought tolerant and will easily spring back from under watering. 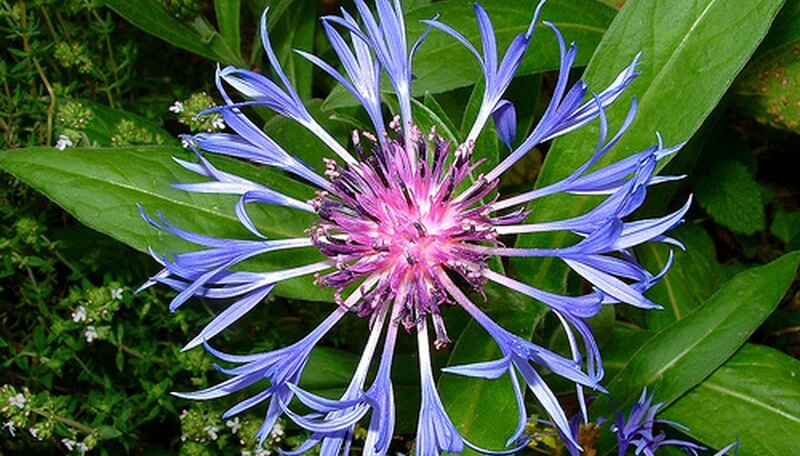 Feed cornflowers once per month during the spring and summer months using a balanced flower fertilizer. Refer to the manufacturer's instructions for proper dosage, and apply half the recommended dose. Cornflower can be invasive if the soil is too fertile, so avoid over-fertilizing. Remove spent flowers as they fade to encourage the growth of new flowers, prolong the blooming period of the cornflower plants and decrease the number of self-sown seedlings. Pinch off the dead flowers as close to the stem as possible using your fingers and discard. Check the foliage of cornflower regularly for signs of aphids and powdery mildew. Remove aphids manually with a hard spray of water. Powdery mildew is identified by a white coating on the leaves and wilted, brown foliage. Remove infected plants and burn them to prevent the disease from spreading. Keep the soil evenly moist after planting until the cornflower seeds germinate, then begin watering infrequently. Over watering established plants can promote the growth of powdery mildew. A second sowing of cornflower seeds in the early summer will prolong the short blooming season by providing a second blooming in late summer or early fall.